Mat_11:5 “Blind receive sight and lame walk, lepers are cleansed and deaf hear, dead are raised up and poor are brought the Good News. Many Pentecostals and Charismatics have said that there are no healings and power of the Ruach haKodesh in the Way of Truth, Hebraic roots, Torah observant believers in Messiah Yahshua. We witness otherwise. The true restoration and repentance is a great move of the Ruach haKodesh and these are proofs The Ruach of YHWH is moving in our midst. We have seen multiplication, deliverance, protection, healing as mighty as in the church. Our lives are proof of that also to all who knew us before leaving the churches we served to Obey Abba and His Whole Word. The transformation and healing in our lives is proof also He has worked a miracle. HalleluYAH~! Mat_9:35 And יהושע went about all the cities and villages, teaching in their congregations, and proclaiming the Good News of the reign, and healing every disease and every bodily weakness among the people. Psa 67:1-3 Elohim does favour us and bless us, Cause His face to shine upon us. Selah. For Your way to be known on earth, Your deliverance among all nations. Let the peoples praise You, O Elohim, Let all the peoples praise You. HALLELUYAH! THE MIRACLE WAS DONE! YHWH IS A MERCIFUL AND COMPASSIONATE ELOHIM. LUIS WENT TO HIS APPOINTMEN AND THE DOCTOR HUGGED HIM AND TOOK HIS CRUTCHES AWAY. HE NEEDS NO SURGERY AND THE BONE IS JOINED! BARUCH ATA YHWH! FAMILY IS REJOICING ON YHWH RAFFA! 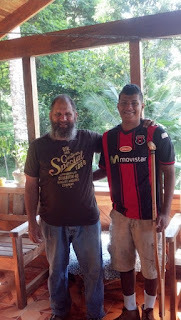 ON SHABBAT WE PRAYED FOR LUIS, COVERED HIS LEG ON MY TALLIT, ANNOINTED HIM AND BLEW THE SHOFAR TOWARDS HIS LEG. WE ARE ALL IN TEARS! HALLELUYAH! ABBA IS GOOD! Isa 58:6-8 “Is this not the fast that I have chosen: to loosen the tight cords of wrongness, to undo the bands of the yoke, to exempt the oppressed, and to break off every yoke? “Is it not to share your bread with the hungry, and that you bring to your house the poor who are cast out; when you see the naked, and cover him, and not hide yourself from your own flesh? “Then your light would break forth like the morning, your healing spring forth speedily. And your righteousness shall go before you, the esteem of יהוה would be your rear guard. We went to see Luis to check and praise Abba YHWH for what He has done. I told him to sit and pulled on his leg. They told him one leg was longer than the other one. To our joy and Abba YHWH completes what He started both feet came to the same length. 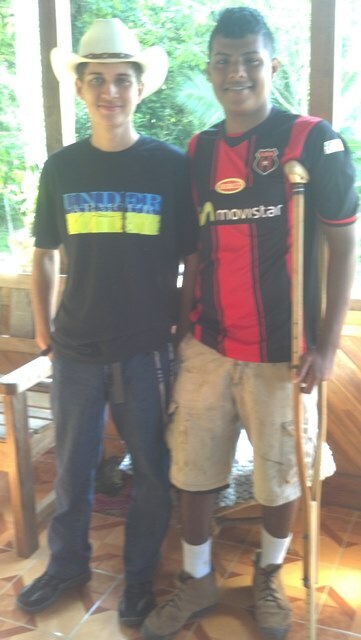 He needs therapy and correct his posture but it is a miracle the surgery was not done and Luis is ready to walk. Please continue to pray and consider our servant family with your love offering. We are reaching out to people, poor, widows and fatherless in South Costa Rica and Nicaragua. We also partner with ministries in Panama, Dominican Republic, USA and Mexico with what we receive. Also we volunteer as translators and management for a couple of international ministries. Please pray and help us take the Torah and Healing to the Nations. Click on the donation button or the Poor, Widows and Orphans donation button.